Indeed, Cynthia! On good French bread, there is no better lunch. P.S. BLT is quite bilingual, but I promise I will get you some more vocabulary soon. I want to add a “me, too”! 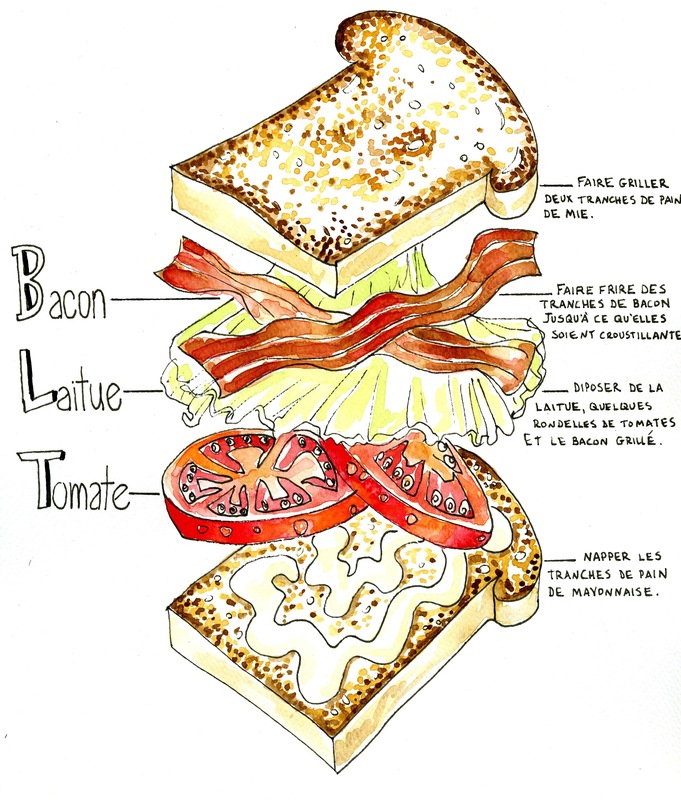 What could be better than a BLT?…..especially with the toast still warm. The French is great beside the American sandwich. Many thanks. Oh absolutely, Etsy is a great idea. I certainly encourage you to do it. Your work is fantastic. And I love the subject matter. The FR/US hotdog comparison is priceless. I love culinary comparisons like that point out our cultural differences. I’m from Chicago too. Hot dogs are a touchy subject for us. 🙂 I just started following your blog so I won’t miss anything. Susan, I’m glad you found me, too. I’ve been thinking about starting an Etsy site to sell some prints. So I am happy to hear that there might be a demand. I try to post every other day. So don’t be a stranger. Thanks again for reading, Pat! Muah!